Our most popular tract that will make people smile and have them coming back for more! 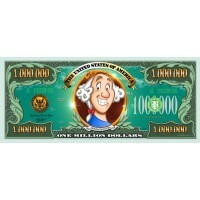 Many people smile when I hold these up and ask "did you get your million?" And then I give it to them and tell them it's a gospel tract and to please read the message on the back. This is probably my most favorite tract that Living Waters offers! Thank you and God bless you! These realistic bills are an excellent way to get the word out. We were seeing more and more folks weary of the traditional tracts and becoming resistant to the usual method by which they were distributed. Turning away the minute you handed one in their direction. Now all we say is "how 'bout a million bucks?" and there's no resistance. Best of all, unlike the old traditional tracts, they hang on to the million dollar tract. These are excellent for those long customer lines waiting outside for a grand opening or some special sales event. We've even started passing them out a political rallies. Don't forget to include one with your tip each time you eat out. These are by far the easiest to pass out !!! We were at a local boat race and passed out around 150 tracts I don't remember anyone turning down the 1 million tract. Of all the Bible tracts I have ever used, this is the only one where people say "Wow, thank you." I use them and few turn them down. I leave them everywhere. I tell people I see who work in the stores, nursing homes, etc. "Hey, thanks a million for all you do!" and they just love it!